One again, it was a great year for underground (for lack of a better term) rock music. This year's top albums include veterans like Paul McCartney and David Byrne. Punk legends like Dinosaur Jr., Soul Asylum, and Green Day. Side projects like Lee Ranaldo of Sonic Youth, Lightships from Teenage Fanclub, and A.C. Newman from The New Pornographers. Robert Pollard, with five releases by himself and his band Guided by Voices, continues his run of having a top 10 album for yet another year running. And the top 10 itself is loaded with exciting new bands that will surely give us lots of joy in the future. To listen to these albums and many other honorable mentions, take a listen and subscribe to my Spotify playlist. In Spotify, search "Paul Mackie" and "Best of 2012." It's always good to be back in St. Louis for the holidays. And we took a break from my mom and dad's festivities in Edwardsville, Illinois to head across the Mississippi River yesterday and visit Rachel's college friend Rachel Korenblatt. After eating lunch with her family (eating has of course been a theme for the past few days), we strolled along my favorite St. Louis neighborhood, the University City Loop. This used to be home of Cicero's, where my old band Birmingham Squadron once got kicked out for Dewey screaming at the soundman and my punctuation of jumping into Matt Beatty's drumset. I think our behavior led to us being one of the few bands not to get Cicero's complimentary pizza for performers. Cicero's is no more, but Vintage Vinyl, one of the country's finest remaining record stores, remains. So does a book store, the Tivoli independent movie theater, and several clothes stores and coffee shops. Not to mention Blueberry Hill and Fitz's. One of the most impressive elements of U City is the walk of fame. The amount of homegrown St. Louis talent is amazing and includes Vincent Price, Stan Musial, Harry Caray, Bob Costas, Robert Duvall, Miles Davis, Rogers Hornsby, T.S. Eliot, Tennessee Williams, and many more. 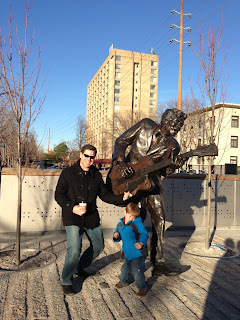 And a new feature since the last time I was in U City is the Chuck Berry statue (pictured). Jackson and I did a little duck walkin'. You For Me For You. How About None of Them? I saw You For Me For You a couple of weeks ago at the Woolly Mammoth Theater in Washington DC and almost immediately forgot the details of the play's content. So reviewing this now is mildly daunting. But what I do remember is that it was about North Korea, which is, of course, an endlessly fascinating and mysterious place. Unfortunately, instead of taking any chances or being truly interesting, the show stuck to the script that North Koreans think Americans are the crazy ones and, conversely, their fearless leader has them set on the correct course. 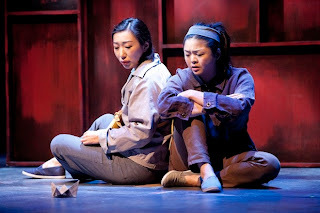 Two sisters decide to escape from the country and their miserable lives, but the sister that is starving and unhealthy decides she can't leave. The other sister makes it to the U.S. and embarks on a relatively happy new life. She drops it all, however, as things reach a high point and returns to North Korea to reunite with her sister. I've been complaining about Woolly Mammoth's shows for a while now, and I really miss the stuff that once made this theater DC's best. Could it be that theater in general just kinda stinks these days? This is a new monthly feature recently introduced. You can stream all the albums mentioned here for free at this Spotify link, which I keep updated. This month's list is dedicated to so many great 1990s artists still being around and still being relevant. 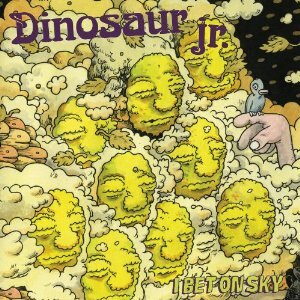 Bringing all the elements of the best Dino Jr. albums (Bug, You're Livin' All Over Me, Green Mind, Dinosaur, and Where You Been), and adding a little bit of string and some Maurice Sendak-like cover art ... what's not to like? I'll buy any new music that J Mascis is associated with for the rest of my life. This album didn't exactly get a lot of love from critics who have grown cynically obsessed with Band of Horses being too likable for their liking. These guys are supposed to be semi-scary lumberjacks, right? Well, I'll just say it: I love the new, poppier direction that this set brings alongside 2010's Infinite Arms. This Chicago band is consistently one of my all-time favorites. You can put their music on in the background or you can throw on the headphones and sail away into wimpy, upbeat, jazzy blissfulness. I defy anyone to listen to opener "On and On" and not want to dig back into more Sea and Cake, like classic albums The Biz, The Sea and Cake, and Nassau. Seems like there's been a lot of critical bashing of Green Day this year, but there's something to be said about a band releasing three albums in three months (this was the first). All three albums basically feature the same hooks that were on Dookie so many years ago. But darn if those aren't still delicious hooks. Remember that album The Sophtware Slump by Grandaddy? Lytle was the leader of that masterpiece, and if you liked that you'll like this ... and anything else he has ever been associated with. His music is kind of like Radiohead without the icky feels-too-important-not-to-like factor. Between his three Guided By Voices and two solo albums this year, this release might be my surprise favorite. It is very similar to his 2000s work with the Doug Gilliard-era GBV. Pretty brilliant and necessary stuff. You can listen to the radio segment by correspondent/photographer Raphaella Bennin and view a slideshow of photos at WAMU. Tom Sullivan ran at life full force. 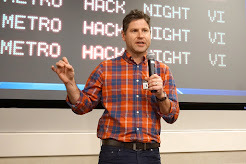 His brother Dan approached decisions with deliberation and caution, so it wasn't uncommon for Tom to jab at Dan, telling him, "Stop being a wimp. Just go out and do things!" In 2000, Tom had an impromptu conversation with a recruitment officer and joined the Marines. The career turned out to be a perfect fit for his personality. "He just went at it full force," recalls Dan. "I mean, he went into boot camp; he got through boot camp. He loved the marines. He actually had the opportunity to quit before he was sent to Iraq, and he believed so strongly that the Marines was what he was destined and wanted to do, so he re-upped." 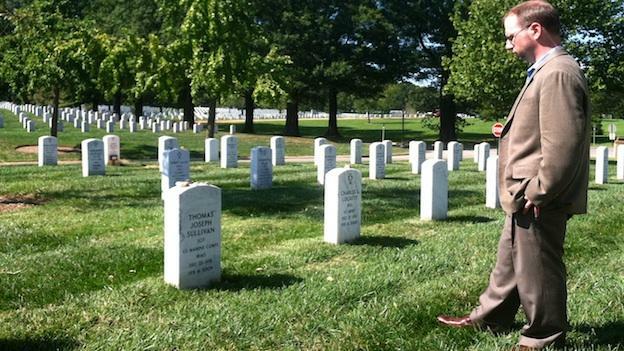 Tom went to Iraq in 2004, but while he was deployed, he started to feel sick. His blood pressure became elevated and he started to have gastro-intestinal problems. "It was very debilitating," says Dan. "He would literally miss three or four hours a day having to be on the toilet." Tom returned to the U.S., but his health continued to deteriorate. He was in intense pain and he became so swollen that new friends didn't recognize pictures of him from a year or two earlier. Tom's doctors couldn't identify the cause. They suspected Crohn's disease and then ulcerative colitis, but weren't sure. He saw more doctors, hoping someone could confidently diagnose him, and he began to carry around a backpack full of his medical records everywhere he went. Even in the midst of his physical suffering, Tom maintained his enthusiasm for life. He got married and had a daughter. Then, in February of 2009, Dan went to Tom's house to check on his brother, and found Tom's body. To read the full story (and it's well worth it), go to WAMU. When I was a teen, I not only devoured just about all of Alfred Hitchcock's movies, but I read several biographies about the man himself and became convinced he's the greatest film director of all time. So it's safe to say I've been waiting a long time for the new movie Hitchcock. His life was ripe with fascinating details and the fact that he is so awesomely funny in a particular British, snooty, yet knowing, way seems to make this an easy home run. Problem is: the movie doesn't dig very deep into the man's story, so it can't help but be at least a little bit of a letdown for a die-hard like me. Nevertheless, it's difficult not to respect the filmmakers' decision to explore a limited bit of the director's life instead of its epic scope. I had forgotten that his wife, Alma (played likably and sympathetically by Helen Mirren), was such a big part of his creative force. The focus on the period around Psycho, which I still think is his best film, is also a winning choice. And the explanation of Hitchcock's passion and influence behind the production, the true story of Wisconsin sicko murderer Ed Gein, is interesting. Anthony Hopkins should be a strong contender for lead actor. My only complaint is that his mouth and eyes make him look more like Hannibal Lecter than the basset-hound like Hitchcock. That said, Hopkins is just plain brilliant. Two of the most memorable scenes are when he goes the extra directorial step to make Scarlett Johansson look terrified in her shower scene and when he proudly views the audience's faces as they light up with horror on opening night. That's why the limited interaction between Hitchcock and Anthony Perkins, Janet Leigh, and Vera Miles behind the scenes is a part that the movie leaves a little too under-explored. When those interactions occur, it is spellbinding. The movie no doubt wins most people over by the end, but a certain un-Hitchcockian mixed bag of suspense makes it difficult to call this movie perfect. 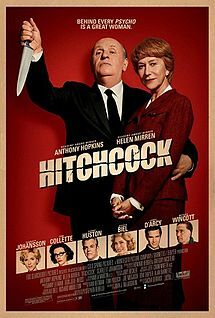 And, with my bias, being less than perfect for Hitchcock is not an easy thing to do.